I have a lot of friends having babies soon and I think a patchwork aeroplane bag would be a nice diaper bag for someone. Thanks for the chance to win! I would definitely make a baby quilt - with rounded corners!! I think these would be perfect for a baby blanket, and I love the mix of colors. I think a patchwork tote would be cute to make for a new mom. A little patchwork quilt, burp cloth, bag, bib-so many possibilities! HI,love your projects! I'd probably make a charity baby quilt! Such a neat fabric collection! I would definitely make your quilt! It is adorable! Thanks! I would definitely try the charm quilt! Thanks! Love your charm quilt.. would try that! I would make the charm quilt. I am giving a baby shower in April and this would be perfect! Making baby quilts is one of my favorite fun things to do, so that's what I would make. Your quilt top is cute -- but not quite as cute as your helper! I love your little quilt and would make a baby quilt as well. I've used your method of sewing the squares into rows and the rows together and the key is leaving some slack between each of the sets. I do like it. Thank you for your giveaway! 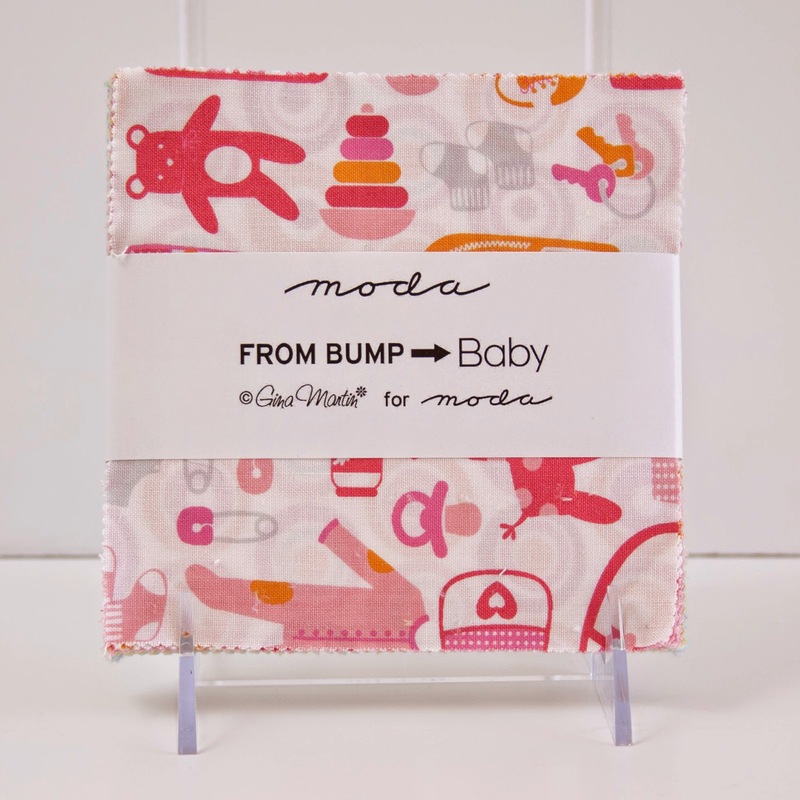 From Bump -> Baby would be perfect for a baby girl quilt!! I have a friend who just had a baby girl-this line would be perfect. I really like your quilt-and the neat way you did the chain stitching. I have never tried doing it that way but it looks fast and easy! I would love to make a baby quilt for my friend. Thanks! Love the charm quilt. Traditional checker patterns are so sweet! Your charm quilt is lovely and quick to put together. My nephew and his wife had a baby in January and I'd like to make a baby quilt for them. I would make it into a quilt. Thanks for a chance to win! I would def make the charm quilt! Thanks for the chance! Your cheery quilt is delightful! I love making charm quilts for baby gifts. They are quick to make and it's such fun to use a variety of fabrics. 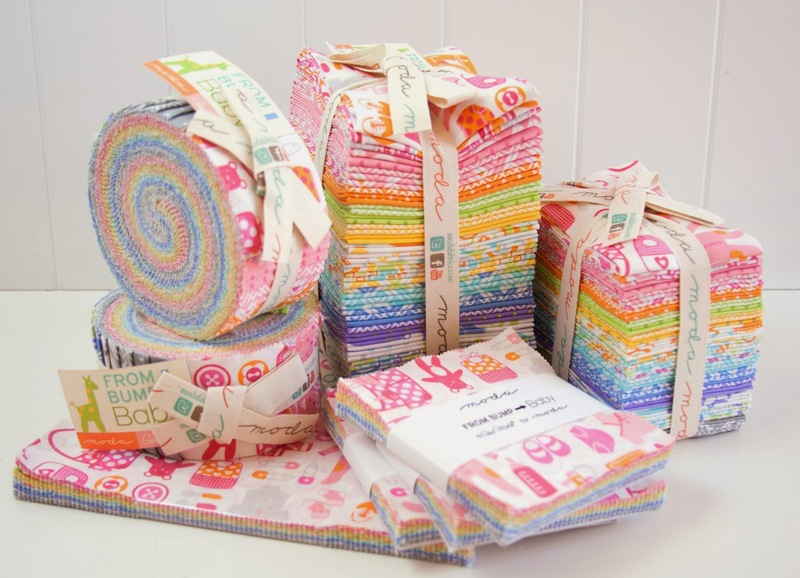 Thanks for the chance to win this lovely fabric! I'd make burp cloths and bibs with this fabric. Love the colors! I need a baby quilt for a friend so that's what I would make. This is such a pretty line. Love the stripes. I would make some little coin purses, perfect for the inside of a pram bag where space is limited! New granddaughter on the way, I have a couple of charm quilts in mind. Congrats on the new machine! I think I would try to make a small quilt for my daughter for the car. She loves her blankies and I am sure she would love a homemade quilt. Thank you for the chance. I just followed you on Instagram (pixelstopatchwork). I am looking for fabric for a QAL...this would be perfect..and if I would be able to have some of the more baby related charms for another project. (hendrick.pj@outlook.com) thanks. I would make a baby quilt. I love making baby quilts because of all the cute fabrics available (like these) and they go together quickly because of their smaller size. I would make a baby charm quilt. It is quick and easy and SO cute! Your baby quilt pattern looks so fun and easy. I think I would give it a try. I would make a baby quilt of course! I would make a baby quilt! Yours is so sweet. Patchwork bibs would be so cute! I just found out, yesterday, that we will have another baby in the family this fall! I think I would make a quilt just like yours - so fast, but very cute ! Thanks for the tutorial and the chance to win this lovely fabric! I would definitely make a cute little baby quilt. Thanks for the chance to win! Also, I started following you on IG! 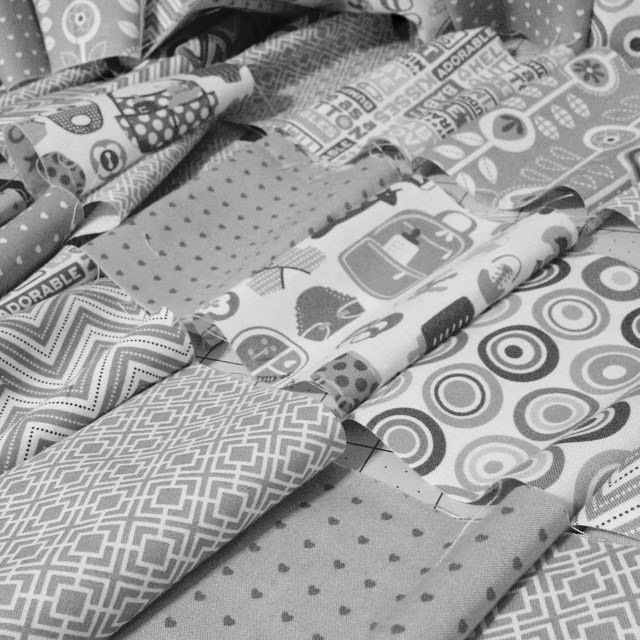 I have a few friends who are expecting, so I will make them baby quilts!! This collection is so sweet, I'd love to win some charms!! Thanks for the chance. I think I would make a changing bag and nappy holder. Lovely fabrics. Thank you for the giveaway. I love charm packs and it would be fun to mix this line up with a little bit of linen for a diaper bag. I would add some coordinating solids and make a mini-kaleidoscope baby quilt, using Mary Mcguire designs "Whirl" quilt pattern. Thanks for the chance. I would make a baby quilt and some burp rags!!! 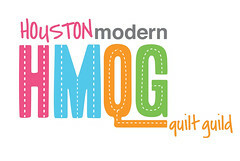 Love your quilt and your tips along the way! I would make several baby gifts including a personalized bibs, a small tote bag, a wet wipes and diaper holder. If any charms are left over, I'd make a burp cloth. Such lovely fabrics! Would make your sweet quilt for my sweet one month old niece. With the charm squares all pre-cut for me, I would definitely make a baby quilt like yours. There should be enough left over for a burp cloth too. Thanks for your cute & quick tutorial! These fabrics would make such a cute quilt! I love your quilt, I would make one of those. I'd probably make a lovely patchwork quilt, like yours. Gorgeous! I would make something for my friend's new baby. So many great projects for so many sweet babies!! I am following you on Instagram, cant wait to see your posts! I'd make a baby quilt too! A quilt for a friend having a baby this Fall!